It could be the most frustrating knot ever created. Scientists have produced the most tightly knotted physical structure ever made, out of loop of 192 atoms. The team from the University of Manchester say it could pave the way for creating ultra-lightweight material which is so impenetrable it could stop a speeding bullet. The knot is made out of 192 iron, oxygen, carbon and nitrogen atoms and is about 20 nanometres long, or 20 millionths of a millimeter. Professor David Leigh, of Manchester’s School of Chemistry, said: "Tying knots is a similar process to weaving so the techniques being developed to tie knots in molecules should also be applicable to the weaving of molecular strands. "For example, bullet-proof vests and body armour are made of kevlar, a plastic that consists of rigid molecular rods aligned in a parallel structure - however, interweaving polymer strands have the potential to create much tougher, lighter and more flexible materials in the same way that weaving threads does in our everyday world. "Some polymers, such as spider silk, can be twice as strong as steel so braiding polymer strands may lead to new generations of light, super-strong and flexible materials for fabrication and construction." Now the knot has been made, the team can start testing the strength and elasticity and working out how to weave the strands together to generate new types of material. Describing how the know was made, Prof Leigh added: "We 'tied' the molecular knot using a technique called 'self-assembly', in which molecular strands are woven around metal ions, forming crossing points in the right places just like in knitting - and the ends of the strands were then fused together by a chemical catalyst to close the loop and form the complete knot. "The eight-crossings molecular knot is the most complex regular woven molecule yet made by scientists." Step aside, Eagle Scouts. 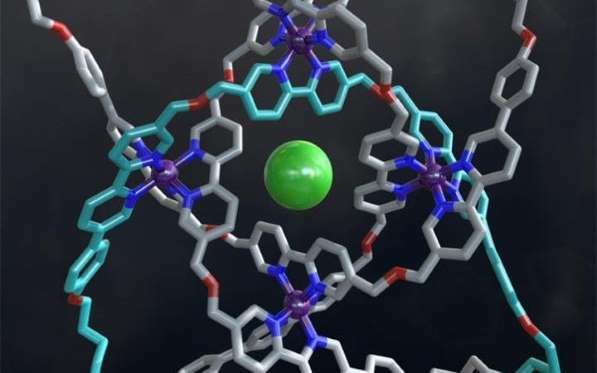 Chemists have tied the tightest knot yet, a nano-sized structure with eight crossings and just 192 atoms. The advance could help researchers learn how to manipulate materials at the atom level to develop stronger, more flexible, and lighter-weight cloth or construction materials. The knot, described in today’s issue of the journal Science, measures 20 nanometers in length, about 100,000 times smaller than the head of a pin. Why make a knot that’s so small? I’ll give you a two-part answer. Part one is that knots come in pretty handy in our world. In nature, DNA can tangle itself up to pack into a cell’s nucleus. Sailors have for centuries relied on a slew of knots, some to hold things in place and others that can tighten and loosen at a moment’s notice. For part two of the answer, put yourself in a chemist’s frame of mind. You are someone who knows that the properties of a substance can be utterly transformed by tweaking atom-by-atom structure. You remember what a big deal the process of vulcanization was to the rubber industry. The technique transformed natural, sticky rubber into the durable stuff of tires and shoe soles. Vulcanization, from a chemical standpoint, was just adding small “bridges” of sulfur atoms to rubber. Now, you look at knots, and how much more intricate they are than a simple sulfur bridge, and you get positively giddy at their potential. Chemists first managed to mechanically interlock a molecule together like a knot back in 1989. The leader of that group was Jean-Pierre Sauvage, and he took home 1/3 of last year's Nobel Prize in Chemistry. Since then, many teams have gotten into this field. In addition to the potential for new materials, molecular knots might also reveal new things about the unseen world of chemical bonds. Can knots make bonds stronger, or weaker, or more reactive? We won’t know until we test them. 0 Response to "Scientists tie tightest knot ever from string of atoms"